2016 was hard. 2016 was the most challenging year of my life thus far. So I am totally on the see ya later 2016 bandwagon. It’s not like at the stroke of midnight there will be a clean slate and there is no guarantee 2017 will be a cake walk. But 2016 will forever be the year my mom was diagnosed with ovarian cancer. In the past my New Year’s resolutions have included healthy eating or the typical working out. And naturally every year I don’t keep up with them. So I have decided to take a more mental approach to my resolutions. In 2017 I’m going to expand my mind. So here we have it. My attainable goals for 2017. Some of these are things I’ve already begun in 2016 but I’d like them to continue. I’m going to read. I just discovered that I really like reading. I’ve already completed two books in the last two month and I’m working on the third and have ordered my fourth. I want my work locker full of books by the time 2017 ends. I’m going to write more. If I’m not writing on the blog I will be writing in my journal. I’ve found it really helps when I’m stressed out. I’m going to put down my phone. This is a big one. After I’ve checked Facebook or my email for the tenth time in a five minute span I sometimes think what are you doing, there’s nothing new there, look around you. So I am going to have some self control because it sometimes makes me feel like a zombie. Start doing yoga. This one might be setting myself up for failure. I love the idea of yoga. I like the deep breaths and calmness and that it’s considered excercise. I just can’t seem to sit down and do it. But I would like to start doing yoga once a week. So there ya have it. These are my 2017 goals. These are the things that I would like to introduce into my life and maybe by having them written down I will stick with them. So farewell 2016, it’s been real. 18 years ago I took a shower and when I got out my Papa Joe was gone. It was winter break from school and we had been traveling back and forth between where my grandparents lived and home. We had come home that day and mom stayed behind to be at the hospital with my grandpa and my aunt. My mom called to tell my dad and then my dad broke the news to the three of us that our grandfather had died and then we watched a magic show on tv in my parents’ bed. I had a rough time at the funeral. I remember kind of hyperventilating while crying. And I remember my cousin who was 6 at the time handing me a nickel to help me stop crying. I think I may still have that nickel somewhere at my parents’ house. There was the wake and the next day we would come back and say our final goodbyes and then proceed to the funeral. When we left the wake my brother who was 6 at the time looked into the casket and said “see you tomorrow grandpa”. My mom’s first cousins created a circle of love and that night we all sat at my grandparents’ house and watched old videos and hung out. It was a sad time but there was so much love. After he died I wrote down a bunch of things I remembered about him that I didn’t want to forget. Sadly I think I’ve lost that notebook but I vaguely remember some of the things I wrote down. I remember one of our last interactions when he was still able to walk around on his own. I was sitting in the kitchen and he walked past and said “that’s my girl eating her mac and cheese”. He would push me around in a laundry basket. He wanted to teach me to polka dance and I regretfully never let him. He always made sure I had Papa’s cheese. I have no clue what kind of cheese it was and I have yet to come across it in the 18 years since he’s been gone. 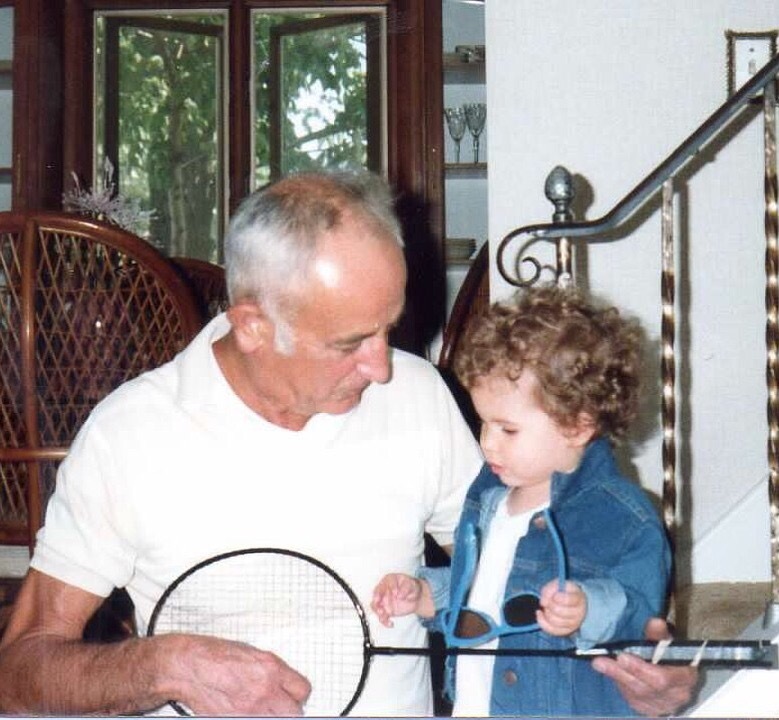 So today on my drive home I will crank up some Frank Sinatra and reflect on the time I spent with my Papa Joe. On my drive into work this morning they said on the radio that Merriam-Webster’s word of the year is “surreal”. And I thought “yup, sounds about right”. As this year is coming to a close I have been doing some reflecting. As we approach Christmas I have been doing A LOT of reflecting. Because on December 24 it will be 6 months since my mom’s diagnosis. And on December 25 it will be 6 months since I sat in a hospital room while a perky doctor told us without chemotherapy and surgery my mom would have about 6 months to live. And on that day in June I came home and quietly cried to my husband while my son took a nap. I looked at him and said 6 months from today is Christmas and he gave me a sympathetic look and said “I know”. I remember that moment so vividly and yet it feels unreal. Sunday we made Christmas cookies and Thursday we will make a gingerbread house like we always do. And in the past 6 months anything we have done like we always do is held incredibly close to my heart. I just take mental snapshots and just think I want to remember how these moments feel. These traditional moments that we have done for years that now feel even more important and special. In June I was angry and bitter and it wasn’t just one thing. It wasn’t why her, why our family. It was the world around me crumbled and everything I knew was gone. And slowly over the past 6 months I have tried to just find joy and appreciation. Because I am well aware of how these past 6 months could have gone. So while I still get scared about her levels and the effects of chemotherapy week to week…I can’t help but have a deep appreciation for all the gifts we have been given this year in spite of her diagnosis. So ya surreal is a really good way to describe my 2016. I show up to my parent’s house about an hour and a half before her appointment. We chat about the most recent episode of housewives or another tv show we have in common and then we hit the road. We park on the same level every time because it has the bridge to the hospital and somehow we manage to always find a spot. We hit up the restroom and then we head to the office and she gets her bracelet and we sit and wait for them to call her name. She weighs in and we get her pod assignment and then we part ways. Today it was a familiar face greeting us in the waiting room. It was my favorite nurse. While I’ve only taken her to 4 chemos I have a favorite nurse. She knows that once mom is seated I leave immediately to go get food because I can’t be there when they access her port for her blood draw. Because there’s a decent chance I would pass out and that may cause a bit of commotion. So I go down to the atrium and get her two bottles of water and look for a snack for myself. By the time I get back they already have the results of her blood draw. She rattles off the numbers to me and we analyze them thoroughly. And then the nurse tolerates our questions. Why would this one go up? Why is this one down? How concerned should we be about germs? And then we look back at previous numbers to see if there are any trends. And eventually her benadryl kicks in and she takes a brief nap. I watch tv on my phone or play pyramid solitaire and then mom and I chat when she wakes up. It’s our routine. It’s our chemo routine and it’s a routine I’d never imagine us having but I’m glad we get to spend this time together.